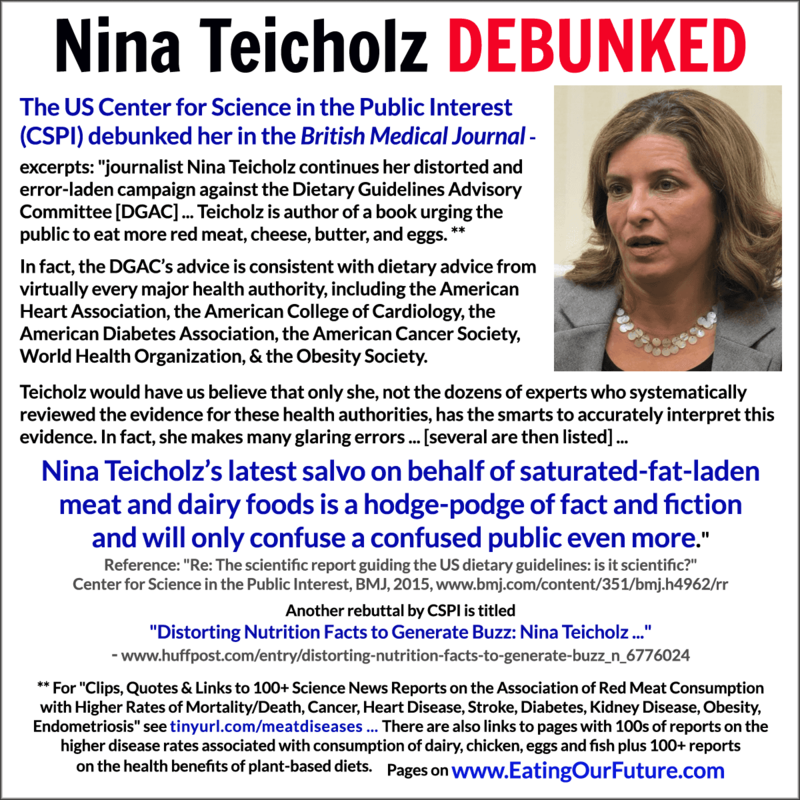 Page Summary: Collection of reports that debunk & refute Nina Teicholz’s promotion of eating disease-related foods high in saturated fat. This page contains excerpts and links to reports on the websites of the British Medical Journal, the HuffPost news site and clips on YouTube. In fact, the DGAC’s advice is consistent with dietary advice from virtually every major health authority, including the American Heart Association, the American College of Cardiology, the American Diabetes Association, the American Cancer Society, World Health Organization, and the Obesity Society. See further below for another refutation of Teicholz by the CSPI from the HuffPost site. The CSPI again debunked Nina Teicholz in an article titled “Distorting Nutrition Facts to Generate Buzz: Nina Teicholz …” by Michael F. Jacobson, Executive Director, Center for Science in the Public Interest (CSPI). The CSPI replies: “Fact: Between 1968 and 2008, heart disease deaths plummeted by 75 percent. Those gains — which were due to better diet, better drugs, and better treatment — are hardly a disaster. True, we are now faced with an obesity epidemic and the ensuing rise in diabetes rates. But where’s the evidence that diet advice is to blame? Americans did not gain weight because of advice to eat less fat. We can blame the obesity epidemic on a diet of super-sized cheeseburgers, fries, shakes, pizza, fried chicken, burritos, cheese nachos, chocolate-dipped waffle ice cream cones, movie theater popcorn (by the bucket), cookies, muffins, cupcakes, doughnuts, and more. And, of course, soft drinks, energy drinks, sports drinks, fruit drinks, and other sugar-sweetened beverages deserve special recognition for expanding the average American’s waistline. The CSPI replies: “Fact: According to the National Health and Nutrition Examination Survey, the average American ate as much fat (about 80 grams a day) in 2010 as in the early 1970s, when the survey started. Because we’re eating more calories overall (largely from refined flour and sugar), a slightly smaller percentage of our calories (33 percent instead of 37 percent) comes from fat. “Nina Teicholz, author of “The Big Fat Surprise,” is a journalist who believes that nutrition scientists are all ignoring research showing that saturated fat is good for us and she erroneously states that it plays no role in disease. She cherry picks studies that support her stories and informs us that the US Dietary Guidelines are the cause of the obesity epidemic. Most evidence-based reviews show that Teicholz lacks the appropriate nutrition expertise to critique studies and put decades of research in context. Many experts question her credibility and you should too. ** For quotes & links to 100+ science news reports on the association of red meat consumption with higher rates of disease and death – click that link. Or go there via: www.tinyurl.com/meatdiseases … It goes to a page on this site. Here are links to pages on this site with 100s of science reports on the higher disease rates associated with consumption of dairy, chicken, eggs and fish; and 100+ reports on the health benefits of plant-based diets.